One of the central issues regarding the pending agreement between the Vatican and the Society of Saint Pius X is the weight of the pastoral Second Vatican Council and its documents. Robert Moynihan, in his report on the negotiations, writes about a visit with Monsignor Brunero Gherardini, who attended the Council and lives at the Vatican. This eye-opening account concerning Alfredo Cardinal Ottaviani, who headed what is now the Congregation for the Doctrine of the Faith, from 1959 to 1968, is worth a quick read. Cardinal Ottaviani, sans mic, went on to co-author the most credible liturgical plea made to Paul VI. Whenever I think about the Council, I said, I always have one image in my mind: an aging Cardinal Alfredo Ottaviani, now blind, about age 80, limping, the head of the Holy Office and so the chief doctrinal officer of the Church, born in Trastevere to parents who had many children, so a Roman from Rome, from the people of Rome, takes the microphone to speak to the 2,000 assembled bishops. "Yes," Gherardini said. "And it was only the third day." "Ottaviani's microphone was turned off on the third day of the Council." "On the third day?" I said. "I didn't know that. I thought it was later, in November, after the progressive group became more organized..."
"No, it was the third day, October 13, 1962. The Council began on October 11." "Do you know who turned off the microphone?" "Yes," he said. "It was Cardinal Lienart of Lille, France." "But then," I said, "it could almost be argued, perhaps, that such a breech of protocol, making it impossible for Ottaviani to make his arguments, somehow renders what came after, well, in a certain sense, improper..."
"Some people make that argument," Gherardini replied. The treatment of Cardinal Ottaviani is sickening - may his soul rest in peace. "How much the SSPX -- and thus the faithful -- will be allowed to ignore Vatican II and its aftermath while remaining in full communion with Rome is really what it all boils down to." Well said Mr. Wolfe. This is exactly what this all boils down to. Have any meaningful qualifications of the nature of this posting actually been made publicly by any of the Ecclesia Dei communities already ? By coincidence, one of the first priests he ordained, on September 21, 1929 was a certain Marcel Lefebvre. Satan (and his minions inside and outside of the Catholic Church) were very active during and after Vatican II, as we have sadly seen these last fifty years. I think these doctrinal talks between the SSPX and Rome could be interpreted as a quasi "Vatican III". The progressivists wormed their way into powerful positions inside the Church to make Vatican II, its documents and its "spirit" the prevailing ideology for fifty years, but this is slowly changing. Cardinal Ottaviani, like Archbishop Lefebvre and others before, during and after the Second Vatican Council still fought for the restoration and lived the true Catholic faith. These men I hope will be canonized someday and IMHO should be already if not for the modernists who run the conciliar church. This is a serious question: Could someone here please point me to a magisterial document that details exactly which parts of Vatican II Catholics are bound to accept and how? I hear so many differnet perspectives and want to know which are orthodox and which aren't. A longer view of history might disabuse you of your belief that a council can be ignored simply because of bad and malicious bahavior. Most of the first seven ecumenical councils contained behaviour as offensive as what's described here, if not worse, including punch ups on the floor. Moreover, the First Vatican Council also contained bullying and shenanigans. The fathers in the minority at Vatican I (according to some reports, nearly 90 voted against the definition of Papal Infallibility and 70 more abstained) complained about being silenced in numerous ways. Many claimed that the Council lacked freedom and that they were not allowed to raise objections to papal infallibility. Blessed John Henry Newman, when he heard of the bullying tactics employed by some of those in favour of the definition, was appalled, though he accepted the Council's decisions. The relative authority of the various documents of Vatican II likewise must be ascertained on theological grounds, not on whether Cardinal Ottaviani had his microphone switched off, as offensive as that is. "...this particular council defined no dogma at all, and deliberately chose to remain on a modest level, as a merely pastoral council; and yet many treat it as though it had made itself into a sort of superdogma which takes away the importance of all the rest." As to Vatican II itself - another interesting study is that which can be done into the influences behind Nostra Aetate. One does not need to be a "mad trad" (with associated unsavoury tendency to antisemitic conspiracy-theorising) to observe that non-Catholics had rather too much influence on the formulation of that document. As recent scholarship has confirmed, it was only thanks to some very last minute interventions that a greater calamity was avoided. One, not all procedures are knowable to all persons. Therefore conditioning the final authority of a Council's documents (especially when promulgated by the Pope in his own name) on procedures would cast the authority of all Councils into doubt, unless each and every Catholic could verify that apporpriate procedures were followed. Point being, if procedural history is used to undermine the authority of Vatican II, it could be used in the same way to undermine Councils which are foundational to our faith. The publically promulgated decisions of Councils need to be evaluated as they stand. Romano Amerio in Iota Unum goes into detail how a number of the regulations were broken at the beginning of the Second Vatican Council to enable the Rhineland Fathers to effectively control the course of the discussions. Must we continue to nod our heads and enthusiastically agree that "Yes, it was the Holy Spirit that shaped these documents"? Or are we now allowed to question a Council that has not only produced so many bitter fruits but one whose very roots were twisted by ill-meaning men? Great post, and please see excerpts from Msgr. Gherardini's book Vatican Council II, a Much Needed Discussion. What truly astonishes me are those Modernists who demand that Traditionalists adhere, upon pain of penalty, to Vatican II's ambiguous and outdated (think: INTER MIRIFICA; The Decree on Social Communication) and pastoral documents, yet ignore the "pride of place" Gregorian Chant is to be given at mass! I have photos of the prelates living it up, laughing it up, wining and dining, with various dishes of meat, seafood and delectables, etc. during the Council (good things, in themselves), like GSA in Vegas. I'm fond of aged scotch and a good time, but one almost gets the impression that the Council was not too serious--a good 'ol boy's club, if you will--all about Aggiornamento. Vatican II was a valid council, but was hijacked by progessives. The 1960s were not pretty in many ways, and that decade was not an opportune time to call a council, to say the least. Like I said, I'm not a stuffy Luddite: I like strong scotch, a fourth generation i-Phone, my fish rare and my meat well-done (my politics are red state, my tastes culinarily blue state, for the most part). But I do like the doctrines I follow clear, unambiguous and unmuddied. Vatican II was, frankly, mud thrown into the clear water of the Church. It explained nothing (of value), confused everything of value, and opened the windows of the Vatican to the "Smoke of Satan". 'Nuff said! Catholic World vol. 105 (1917), 336. ...the Mass and the sacraments are lawful, for those who use these various rites are in full communion with Christ's Vicar on earth. J.F. Sullivan, The Externals of the Catholic Church: Her Government, Ceremonies, Festivals, Sacramentals, and Devotions (P.J. Kennedy, 1917), 371. The Catholic Historical Review vol. 6 (1927), 760. Asistance of Holy Spirit is not Inspiration dogma. That must be clear for everybody. Human procedures drive the council untill the final signature of Pope. All (including signature) are humans acts and of human author. The Holy Spirit assist for the whole result in avoiding the definition of an error but not avoid the mistakes and imperfections of humans that make the council and, of course, the bad will of this humans in those procedures. The text is not like that inspired of the Sacred Scriptures, because God is not a true author of it. So the quantity of truth is not univocal and depends of the quality of the text and intention of authors with Revelation. Gherardini has write about this very clear. How ironic...45 years to the day of the Prophetic Apparition of Fatima (10/13/1962), the Truth was silenced. Your examples, by my reading, are nothing more than "full" being used to EMPHASIZE the word "communion." There is no evidence (in the examples you gave) that they were meant to offer theological precision as to the "degree" of communion. I urge the people who publish for Rorate to read this most recent letter that will be in the latest edition of Sedes Sapientiae (the quarterly journal of the Fraternity of St Vincent Ferrer). It is a review by Louis-Marie de Blignières on a book by Abbé Bernard Lucien. The whole text is in French and 24 pages long. It touches on crucial points on the degree of Magisterial authority of Vatican II. I have cited this execrable incident many times in the past and if it alone does not symbolise the rejection of Tradition at the Council then I will just reach for the Cabernet and put on Vivaldi because I do not know what else so perfectly encapsulates the euphoria in the minds of those bastards suddenly at liberty to raze the bastions. A giant of a man, a man who personified Tradition, being mocked by modernists was a dead give away as to what was afoot in the minds of those scoundrels. As to the idea that I am constrained to accept the Council? There were PLENTY of Bishops in attendance at the Council who voted NO on more than one of the Conciliar Documents and yet they were allowed to leave the Council in full union with the Pope -such a thing had never happened before. If Bishops voted against one or more of the Documents and were not constrained to accept the Documents or be anathamatised prior to leaving the Council - and that is what happened -then there is NO justification to try and bully (I was gonna use another Vermont idiom with Bull in it) the SSPX into pledging fealty to V2. Think you're rather begging the question there; the usage certainly seems consistent with the contemporary usage, given that the context is a discussion of the Eastern rites. Similarly, I am looking now at a book published in 1850 by a Catholic press in London which, in speaking of the condition of the early Church, observes that there were times when some churches enjoyed a merely "partial communion" with the Holy See. Those who demand we reject the use of partial/full language when referring to the existence of communion between Christians will have to make stronger arguments than "it's a Vatican II/Modernist fabrication". "Must we continue to nod our heads and enthusiastically agree that 'Yes, it was the Holy Spirit that shaped these documents'?" Conservative Catholics who defend the Council are wont to say that the Council itself was a fine and necessary thing, but those dastardly progressives hijacked the implementation of it. On the contrary, the Council was hijacked from the start. The Holy Spirit was there to prevent the Council Fathers from solemnly promulgating serious compromises with doctrine, which nearly happened on several occasions. "A giant of a man, a man who personified Tradition, being mocked by modernists was a dead give away as to what was afoot in the minds of those scoundrels." Agreed. Poor Cardinal Ottaviani. He absolutely did not deserve that treatment, and the lack of decorum on the part of his fellow Bishops and Council Fathers. May the soul of this giant of the Catholic Faith rest in peace. Re: the breaking of regulations by council fathers and periti, Abp Thomas Morris refers to that in this 1992 interview - may be of interest. None of this surprises me in the least. Have you ever heard the rounds of applause after a Novus Ordo Mass? We are dealing with barbarians and miscreants, and have been dealing with them all along. Perkins, I should have banned your comment, but I have a soft spot for anyone that uses the word "miscreant" in a blog comment. There was this one confusing Ecumenical Council among those first seven. Pope Gregory the Great wrote in a letter to some bishop that it is better not to mention that particular Council, it's definitions and peacefully go on with our lives because it caused too much of confusion...which Councik was that, could someone tell me? "Since the Second Ecumenical Council of the Vatican, recently brought to a happy termination, has promulgated some very wise documents concerning both doctrine and discipline, in order more effectively to promote the life of the Church, all the people of God have a serious duty to strive with all earnestness to put into practice everything that was solemnly proposed or decreed by that vast gathering of Bishops under the guidance of the Holy Spirit and the presidency of the Supreme Pontiff." Yes- the "spirit" was string that day! According to Fr. Wiltgen, Ottaviani exceeded his speech limit by far, and so the closing of the mic may not have been unreasonable. As for degrees of communion: I think it is an extreme position to state that there is only "full" or "no" communion. What are we to say, then, of a person who is a member of a schismatic or even a heretical church but who comes to believe sincerely in the Papal primacy and stays in his own church to promote that doctrine and work for reunification? Or even a whole church where there is a Catholic and a schismatic party who vie for power, such as in the Ukrainian Church in the 1600s? According to the first pages of The Rhine Flows into the Tiber, on October 13, 1962, the Council Fathers met for only fifty minutes, including Mass. That meeting reportedly involved Archbishop Pericle Felici explaining the election procedures for the ten Council commissions. While he spoke, Cardinal Lienart, in order to avoid widespread election of Fathers who served on the preparatory commissions, rose and proposed that the Council Fathers needed more time to study the qualifications of the canditates. He was seconded by Cardinal Fring. Then Eugene Cardinal Tisserant acceded to their request and the meeting was adjourned until October 16. There is no mention of Cardinal Ottaviani speaking. On October 30, the day after his seventy-second birthday, Cardinal Ottaviani addressed the council to protest against the drastic changes which were being suggested in the Mass. "Are we seeking to stir up wonder, or perhaps scandal, among the Christian people, by introducing changes in so venerable a rite, that has been approved for so many centuries and is now so familiar? The rite of Holy Mass should not be treated as if it were a piece of cloth to be refashioned according to the whim of each generation." Speaking without a text, because of his partial blindness, he exceeded the ten-minute time limit which all had been requested to observe. Cardinal Tisserant, Dean of the Council Presidents, showed his watch to Cardinal Alfrink, who was presiding that morning. When Cardinal Ottaviani reached fifteen minutes, Cardinal Alfrink rang the warning bell. But the speaker was so engrossed in his topic that he did not notice the bell, or purposely ignored it. At a signal from Cardinal Alfrink, a technician switched off the microphone. After confirming the fact by tapping the instrument, Cardinal Ottaviani stumbled back to his seat in humiliation. The most powerful cardinal in the Roman Curia had been silenced, and the Council Fathers clapped with glee. "What are we to say, then, of a person who is a member of a schismatic or even a heretical church but who comes to believe sincerely in the Papal primacy and stays in his own church to promote that doctrine and work for reunification?" I'd say he is not in communion with the One Holy Catholic and Apostolic Church. I'm unfamiliar with the example from the Ukrainian Church in the 1600s, so I won't comment. "mad trad" (with associated unsavoury tendency to antisemitic consiracy theorising). It may not be your intention, but this appears to be an insult to those traditional Catholics who have been fighting for the restoration of Holy Mother Church since the Council. Wasn't this reported in The Rhine Flows into the Tiber? That the mic was shut off isn't anything new. Correlation does not mean causation. Bad fruit following Vatican II was the result of the "spirit of the council," not the actual documents which are mostly beautiful and have much to say to the Church of today, in spite of the well noted amiguities in some places. If Vatican II had been received properly and not as an excuse for revolution and dissent then it would have produced good fruit. Vocations blossoming. Churches and schools are full with new ones being constructed. FSSP seminary. That is the true fruit of Vatican II friends. "How ironic...45 years to the day of the Prophetic Apparition of Fatima (10/13/1962), the Truth was silenced. " 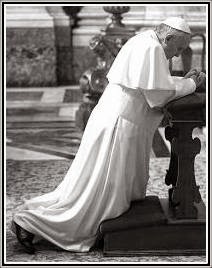 Lets not forget what the Holy Father said when he visited there in 2010: "it would be mistaken to consider the prophetic mission of the apparitions at Fatima complete." Mistaken indeed, 2017 is the 100th anniversary and also the 500th of Luther. Just my opinion but LOOK OUT in 2017! Sequentia, the problem is precisely this, that no-one knows with the clarity that you desire and request "exactly which parts of Vatican II Catholics are bound to accept and how?" Doc and Stephen M, no need to find hidden meanings in what is simply a historical account. Procedural history is not necessarily being used to undermine the authority of Vatican II and to ignore it, but rather to point out the unscrupulous methods certain men used at the council to get their own way. Granted, if such unscrupulous men are in high clerical positions they nevertheless deserve the respect which is their due when they act in accordance with the mind of the Church. perennial teaching of the Church then yes, they are to be regarded with the utmost caution, even suspicion, because there is a clear danger that they may be the wolves against which we have been warned in the Gospel. Yes, it is then most educational to examine their modus operandi and compare and contrast it with their motives, whether stated outright or merely implied. previous councils were an excuse for bad things in the latest council. And besides, if people in the past had not discussed and documented certain goings-on in previous councils, similarly as people are now discussing and documenting Vatican II, you would be in no position to comment upon them as you have done. GE, as Brian has indicated, Fr. Wiltgen reports that Cardinal Ottaviani went over the 10-minute time limit in his speech and seemingly ignored the warning bell at 15 minutes. In my book that is *not* exceeding the speech limit *by far*. The response that followed is also *not* reasonable in my book; not in any civilized context, and most certainly not in the catholic setting that Vatican II was supposed to be. treasure of the Church against miscreants for all he's worth. I suppose that some would say that he was not being 'reasonable'. But in my book he's a true hero. And in my book not a single one of those lily-livered wimps who laughed and clapped their hands with glee in their confident and comfortable bonhomie could hold a candle to him. flouted the rules of procedure - which had been legitimately agreed upon - in ways too numerous to list here, *and* in total impunity. Not only should their mics (sic) have been switched off they should have been banished in disgrace. She is one of those people who have got one cause on the brain. It is the good old 'Jewish revolutionary' bogey. But there is a type of unstable mind which cannot rest without morbid imaginings, and the conception of a single cause simplifies thought. With this good woman it is the Jews, with some people it is the Jesuits, with others Freemasons and so on. The world is more complex than that. We have all encountered such people (online, if not in person), and as was seen during l'affaire Williamson, they can do tremendous damage to the traditional cause by associating it with their crackpot notions. There was not on thing understandable or reasonable about what the modernists did to the great Roman Traditionalist, Alfredo Cardinal Ottaviani. However, when modernists are called on their malign actions one can always count on one of the sheep to rush to their defense proffering excuse after excuse. Coud not one of those modernists gotten off of their pampered butts , walked over to the great man, and indicated to him that his time was up? No. I do not buy one of these excuses because the laughter and the mockery of the modernists revealed what was in their heart; and as to the conservative Bishops who remained silent during this despicable outrage, well, that is what conservative catholics do when they are not trying to excuse execrable actions. "Wasn't this reported in The Rhine Flows into the Tiber? That the mic was shut off isn't anything new." Part of the above story is indeed in that book, which was written in 1967. Monsignor, though, gave some new and/or different details just this week, the reason for the new posting. At the same time, I am guessing most of us who read this blog were born after 1967. Please allow us to catch up a little on some of the essential reading! I'd like to humbly (and light-heartedly) support P.K.T.P. in the comment you allowed. The definition (archaic) of miscreant is unorthodox or heretical, which certainly can apply in the situation he proposes. And the use of barbarian, while not conforming necessarily to modern use (though perhaps to their art and architecture), was originally an imitation of their language, demonstrated as someone who speaks unintelligibly. The Romans heard it as Bar, Bar, Bar, somewhat like we today would say Blah, Blah, Blah. Anyone who speaks with words emptied of their meaning is speaking unintelligibly, making them barbarians at best, modernists, currently, or worse, gnostics. I have mixed sentiments towards +Ottavani. His positions towards Tradition were courageous, but gunning after Fr. Feeney was not cool. I guess every man's life is wrought with success and failure. Astemp, of course you are correct. And of course I am correct in knowing why he used those words! Either way, I appreciate bombastic, so it's fine. I susbscibe to Moynihan's magazine "Inside the Vatican" and find it an excellent source of well-balanced news and interviews. 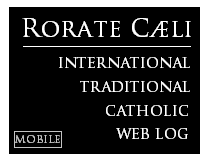 The new website will be a good addition to the Catholic press. There is an article in the January issue of Christian Order which cites a book by Roberto de Mattei (Il Concilioi Vaticano. Una Storia mai scritta)which is very informative and perhaps explains that the Society of Pius X has a very valid point. Sooner or later the Vatican will have to acknowledge the extent to which VaticanII was hijacked; only by honestly doing so can the "lost" generations of Catholics who embraced the documents of Vatican II without assessment or critique and then went on to lose the faith, be brought back. It is this group which need to be "brought back" more than Pius X Society. I am really saddened at the continuous "pessima figura" so many church leaders give to the Holy Catholic Church! I must confess I do not understand them at all...and often wonder what on earth they are up to. What manner of men would allow such a thing to happen to a venerable Prince of the Church? Who were those people that the future of the Church was entrusted to at that " oh, so wonderful" Council? Over the last 4 and a half years I have read quite a lot about what has happened in the Church since the Second Vatican Council, for my own understanding as a serious Catholic - but I have so many "whys" that still have not been answered. Still puzzled and perplexed - yet I love the Church. Ah yes, duh bestest council what ever wuz! It is inspiring indeed to hear these giants among men speak in later years of how their momentous documents, pronouncements and posturings were awash in the inspiration of the Holy Spirit!! "Bishop Johannes Pohlschneider of Aachen, Germany, suggested that the Lenten fast be restricted to Ash Wednesday, Good Friday, and the morning of Holy Saturday. He gave two reasons: one, that modern men generally did not observe the law "because of the speed of modern life and widespread nervous tensions," the other, that many bishops and priests dispensed themselves from fasting on the grounds that it deprived them of the strength they needed to perform their extensive pastoral duties. If bishops and priests did not fast, Bishop Pohlschneider observed, the faithful could hardly be expected to do so. At the same time, since "the Christian life could not be expected to exist for long without a spirit of penance and self-denial," the faithful [but not the hardworking bishops and priests?? RRD] should constantly be admonished to make "specific sacrifices." So, saith the Holy Spirit, "have another donut, Pohlschneider, and pass the box around. All this inspirational cogitatin' has sapped your strength!! Give the plain ones and crumbs to the faithful, that they might make a "specific sacrifice" or two!!" Not exactly mindful of the Cure of Ars, is it? "[The Ancient Doctors] knew the capacity of innovators in the art of deception. In order not to shock the ears of Catholics, they sought to hide the subtleties of their tortuous maneuvers by the use of seemingly innocuous words such as would allow them to insinuate error into souls in the most gentle manner. Once the truth had been compromised, they could, by means of slight changes or additions in phraseology, distort the confession of the faith which is necessary for our salvation, and lead the faithful by subtle errors to their eternal damnation. This manner of dissimulating and lying is vicious, regardless of the circumstances under which it is used. For very good reasons it can never be tolerated in a synod of which the principal glory consists above all in teaching the truth with clarity and excluding all danger of error..."